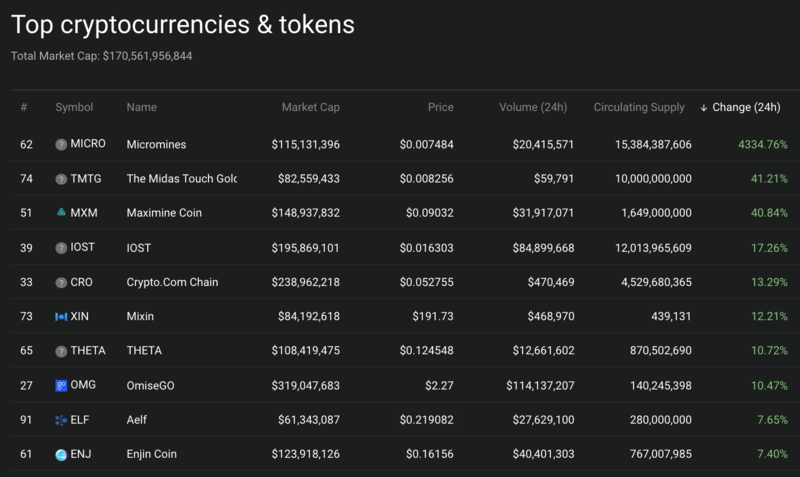 Bitcoin (BTC) is now trading at 4936 USD just below the 5k psychological level, but it is still keeping over 20% gains from the last week. 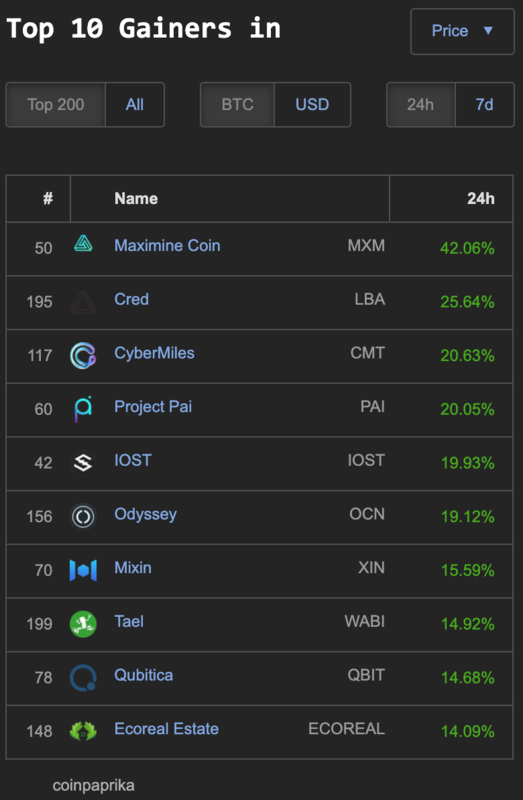 Coin360.io has 7 coins gaining double digit percentages in the top 100 market cap: The Midas touch Gold (TMTG) 41%, Maximine Coin (MXM) 40%, IOST 17%, Crypto.com chain (CRO) 13%, Mixin (XIN) 12%, THETA 10% and OmiseGO (OMG) 10%—however, topping this list is Micromines (MICRO) with 4334% gains. 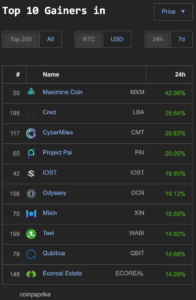 The top ten coins within the 200 market cap on Coinpaprika.com: Maximine (MXM) 42%, Cred (LBA) 25%, CyberMiles (CMT) 20%, Project Pai (PAI) 20%, IOST 19%, Odyssey (OCN) 19%, Mixin (XIN) 15%, Tael (WABI) 14%, Qubitica (QBIT) 14% and Ecoreal Estate (ECOREAL) 14%. 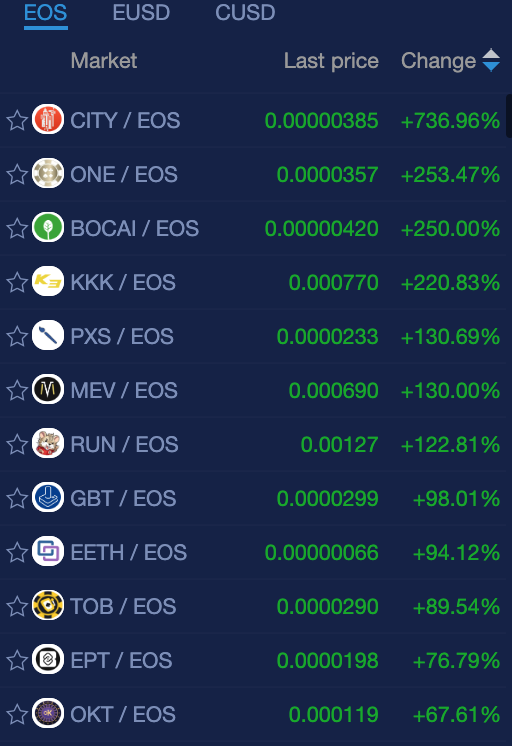 Once again EOS platform coins & tokens lead most of the cryptocurrency market with 7 coins having 100% gains on NewDex.io: CITY (736%), ONE (253%), BOCAI (250%), KKK (220%), PXS (130%), MEV (130%), and RUN (122%). 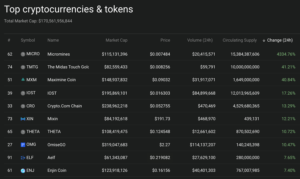 There are also 17 other coins gaining double digits—some of those non gambling coins/tokens include: EETH (94%), YT (62%), PATR (36%), DAB (33%), HVT (24%), PEOS (21%), PTI (15%) and NDX (10%). 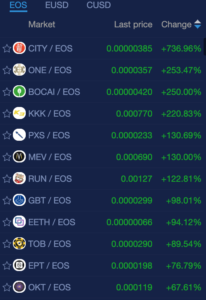 EOS coins/tokens have seven projects with over 100% gains on NewDex.io.